After a morning wander around Point Cook, we took advantage of this rare westside excursion to lunch with Lisa and the Moody Noodles. 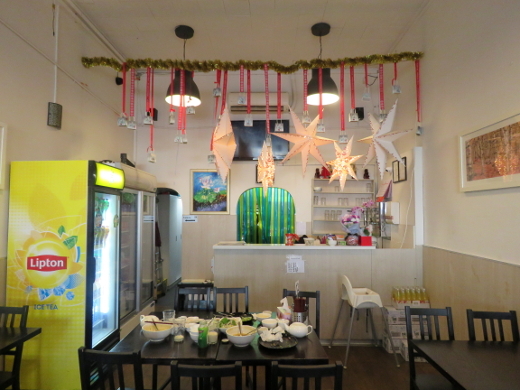 To our delight, Huong Viet was open on this public holiday and happy to hold a table for us. We piled in and keenly scanned the menu - by my reckoning it's all vegan with the exception of their potato wedges with mayonnaise. Unfortunately there's not a lot for coeliacs, with mock meat abounding. 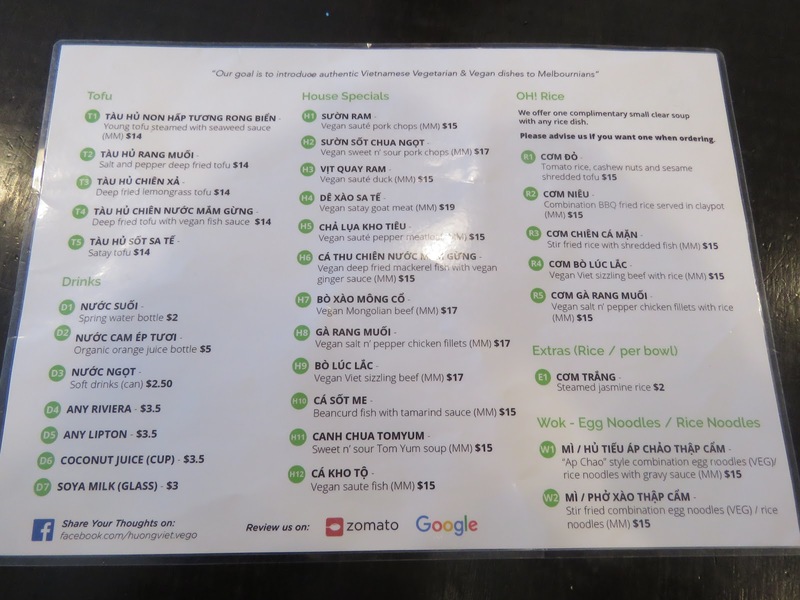 K was limited to a plate of tofu-stuffed rice paper rolls, and the staff were very understanding about avoiding soy sauce and what dipping condiments would work for her. 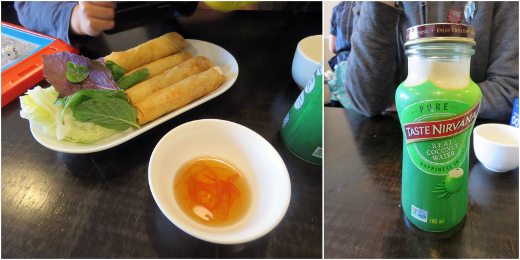 The rest of us took to the Vietnamese menu with gusto, starting with some pleasantly peppery spring rolls ($8). I rehydrated with a coconut juice ($3.50), which wasn't bobbing with sweet coconut flesh as I'd secretly hoped it would be. The Hainan chicken rice ($15, pictured above left) was very popular around the table - the chicken was juicy, the rice oily, and the dipping sauce brightly flavoured. 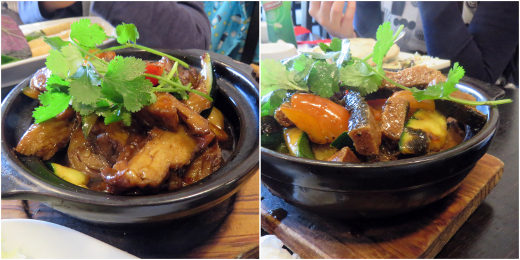 The claypot of saute pork chops ($15, above right) was Lisa's pick of the table. 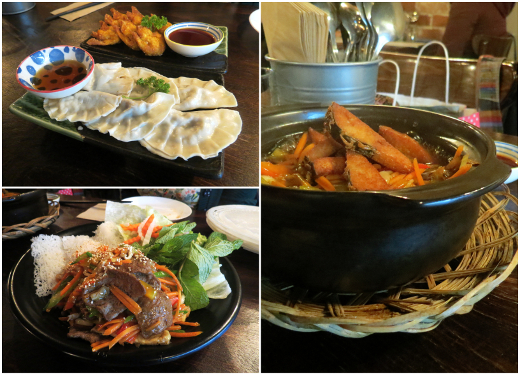 Meanwhile, I was more devoted to the saute duck ($15, above left), with its tender texture and layer of 'skin'. The deep-fried mackerel ($15, above right) had the pungency of its namesake and a terrific ginger sauce. Three of our dishes ended up looking a bit samey, but we all found different things to enjoy among them, eagerly shifting the options from one end of the table to the other and soaking up the sauces in our rice bowls. The staff were welcoming, helpful with ordering, and didn't rush us out. I wouldn't hesitate to come back and do it all again. 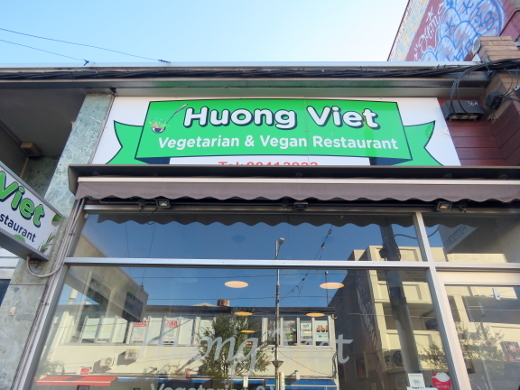 Huong Viet has already received positive coverage on Veganopoulous. Accessibility: There's a step up on entry. The interior furniture is moderately crowded. We ordered at the table and paid at a high counter. We didn't visit the toilets. We had such a good time trying out the new Italian-themed Smith & Daughters dinner menu that we joined the same friends just a few weeks later to have a shot at brunch. It's had the same kind of makeover, with old favourites like the hash and the pancakes making way for breakfast pizza, meatballs and bombolini. Cindy kicked off with a grapefruit juice ($7.50) - it's great that they're doing the fresh juices again. The four of us put our heads together and came up with a food plan - 3 savoury mains plus a couple of small dishes and then breakfast dessert. We started with the spaghetti frittata ($12), which is served at room temperature with a wonderful tomato sauce. This hit the spot, but we all needed some hot dishes to warm us up in these dreadful winter months. That came with our savoury mains: parmesan scramble (with broccoli rabe, chilli, lemon and garlic, $19), the mushrooms and ricotta on toast (with garlic and crispy orgeno, $20) and the breakfast pizza (pesto, mozzarella, tofu scramble, prosciutto, fried capers, chilli, parmesan and rocket, $20). Everyone was gaga for the two toasty dishes - the scramble has become a home-made favourite here since we got the cookbook, but the restaurant always delivers something better than we can whip up. It's eggy but not overwhelmingly so and paired perfectly with the lemony greens. The mushrooms and ricotta were possibly even better. The mock-ricotta doesn't really mimic the cheese, but it's a rich savoury spread that brings out the best in the mixed mushroom combo on top. The pizza was possibly my favourite - a crispy base topped with that glorious tofu along with some chunks of fresh chilli and little bursts of fried caper goodness. I'd ditch the rocket on pizza as a general principle, but otherwise this was top notch. We eventually got our final savoury dish - the potato skins were sold out, but they served us up a different spud dish instead: roasted potatoes with an olive-y mash to give it a salt and vinegar-y flavour. (These came out late, so we got them for free.) We could barely make a dent in them at this point, but they were a huge hit (and we roundly enjoyed the leftovers at home later). For breakfast dessert we couldn't resist an order of the bombolini (5 baby doughnuts filled with vanilla bean custard, $16) and a serve of the limoncello rice pudding (with a fresh citrus salad and rosemary vanilla ice cream, $15). They came out with candles and sparklers because Nat and I were both celebrating birthdays and because Mo is a delight. The doughnuts are always delightful - hot and crispy, with a big spurt of delicious custard inside. The rice pudding was a slightly less impressive version of our dinner dessert - it was still fantastic, but it missed the crispy brulee top. This new Italian version of Smith & Daughters is really kicking some goals - both our recent dinner and this brunch are among the best meals we've had since they opened. I love that they can reinvent themselves like this and can't wait to see what comes next (after we go back a few more times during this iteration of course). You can also read about one, two, three, four, five, six, seven, eight, nine of our previous visits. Nobody seems to have blogged it in the few weeks since our last visit. Accessibility: The entry is flat and narrow and the tables are pretty crowded. The interior is dimly lit and loud at night but much brighter in the daytime. Toilets are located up several steps, are gendered and of standard dimension. We ordered at the table and paid at a high counter. Michael's birthday fell during a work trip this year, and we made sure to book a special meal out to celebrate a couple of weeks later. In the interim, we learned that Michael's chosen restaurant hasn't been paying its staff the superannuation they're owed, so we cancelled our spot and returned to Etta instead. This second wonderful experience at Etta has cemented it as our first preference for all foreseeable special occasions! 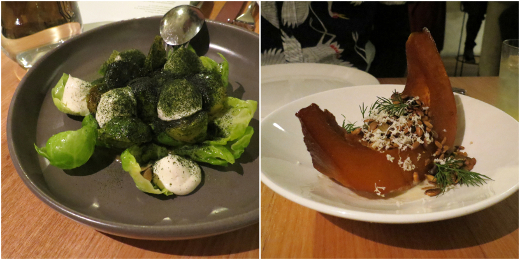 Their vegetarian 'leave it to us' spread ($65 per person) was a delight from start to finish, and an interesting seasonal contrast to the late-spring version we enjoyed there last year. A nice little bonus is the couple of housemade seasonal sodas ($8 each) available for those of us who aren't feeling boozy. I started with the zestier grapefruit, rosemary and juniper one (pictured above right), while Michael chose the lighter spiced apple (above left). Thankfully, no matter the season, Etta have spongey sourdough and their incredible burnt butter ready to go. These were rapidly followed by crudité with concentric pools of chèvre and watercress emulsion. An entree of battered chickpea fritter, globe artichokes and sorrel ranked among my favourites of the night. We learned that there's one special dish that is always, always on the menu by popular demand - the tamari roasted buttercup pumpkin wedge. While we all liked it the first time, it made a stronger impression on me on this visit - the accompanying sauce was so deeply savoury, reminding me of white miso, and the sunflower seeds were roasted to their nuttiest. It was well accompanied by a plate of Brussel sprouts, some of their leaves holding spoonfuls of labneh, and all of them seasoned with a seaweed powder. The mains were a little more than we could handle! Eggplant a la greque (pictured above left) was impossibly sweet, served in a puddle of tofu creme and smothered in panko. Potato gnocchi (pictured above centre) were almost glazed in butter and accompanied with hearty pine mushrooms and chestnuts. Dutch cream potatoes (pictured above right) were roasted to crusty golden perfection, deceptively garlicky, and crowned with crunchy saltbush. We could barely do those beauties justice. We asked for 10 minutes extra mercy before dessert came out, and it proved to be a magical combination of fresh, tart and comforting in a teeny bowl. A sphere of mandarin sorbet was dropped into a cheesecake of custard consistency; it's covered with a spoon of warm ginger caramel and a few vesicles of native finger lime. This is one of the more exciting, satisfying high end meals we've experienced in recent years (only Ubud's Locavore comes to mind as an equal), and it's a bit more accessible than most. As we ate, we tried to concoct all sorts of ways to visit Etta more often. Could we just drop in for a drink after work, maybe order that butter bread? Invite a friend and snack on the potatoes...? Just have the gnocchi and call it dinner...? Or sneak in late for dessert? Whatever the excuse, we've vowed to return when we can and keep supporting this lovely restaurant. You can read about our first visit to Etta here. Accessibility: The entry is flat and there is one step up from the bar area to the dining area. Tables are moderately spaced and lighting is quite dim. We received full table service. Toilets are unisex and spacious, but we didn't notice handrails or other mobility aids. My Sydney weekend wasn't all old faves; we planned some new activities and foods! The centrepiece was a night inside the Sydney Opera House's Concert Hall, featuring the phenomenal Solange. Her performance will go down as one of my all-time favourite live events (and I've tucked one more photo of her at the end of this post). A day earlier, travelling into Sydney by train, my weekend companion made the outrageous suggestion that we lunch at the all-vegan Gelato Blue. We did, and we loved it! 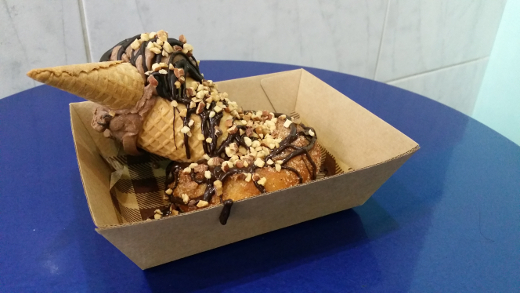 I ordered a hot-and-cold doughnut sundae ($13): a warmed-up cinnamon-sugar doughnut and a large scoop of gelato joined together with wonderfully weird waffle cone limbs, all drizzled in Ice Magic-style chocolate sauce and crushed nuts. The chocolate hazelnut scoop I chose was lightly salted and very, very good - though the embellishments were delightful, methinks this gelato doesn't actually need dressing up. The Buddha Bowl Cafe was a nice low-key spot for Saturday brunch. It's vegan by default with a few vegetarian options (halloumi, eggs, dairy milk) available as add-ons. This place has a wholefood vibe, with all the hits (avocado, hummus, a rainbow of fresh produce) and misses (kombucha on tap, blue algae lattes, raw-only cakes) that entails. My plate was the biggest hit at the table: sourdough French toast made with coconut cream ($12), served with maple syrup, date caramel, dried coconut, coconut yoghurt and lots of fresh banana. A day later, Another Outspoken Female and her Significant Eater whisked me off to the very popular Petty Cash Cafe. I loved its homely, cluttered atmosphere; mismatched crockery, tea cosies and crocheted knee blankets for those of us sitting outside. Though Petty Cash does serve meat, it's made some special efforts for its veg*n customers, such as scrambled tofu, vake (fake bacon), and fluffy chia-based vegan pancakes. While I was initially drawn to the Vegan Big Brekkie, I ended up doubling down on French toast ($17.90), receiving excellent golden slices of sourdough with just enough maple syrup and plenty of crispy-then-chewy vake. My one disappointment was that the seasonal fresh fruit I saw listed amounted to a single strawberry garnish (most likely my fault for misreading the menu), but AOF generously shared the bananas and raspberry sauce that accompanied her pancakes. These were all beaut meals, though it's the time I spent with people - a couple of Melbourne mates, a handful of Sydney-siders and, from an admiring distance, Solange Knowles - that I'll remember best from this weekend away. Nevertheless, the story of That Time We Lunched At Gelato Blue might last a couple of rounds... ! I just had a whirlwind weekend in Sydney with a friend! Circular Quay was showing off its Vivid projections by night, and we followed the early nightfall with a couple of early dinners at restaurants we already knew and loved. On Friday we eased into Vina without a reservation, though it filled up and turned tables a couple times while we were settled with a local friend. Vina has had a complete refit since my first visit! 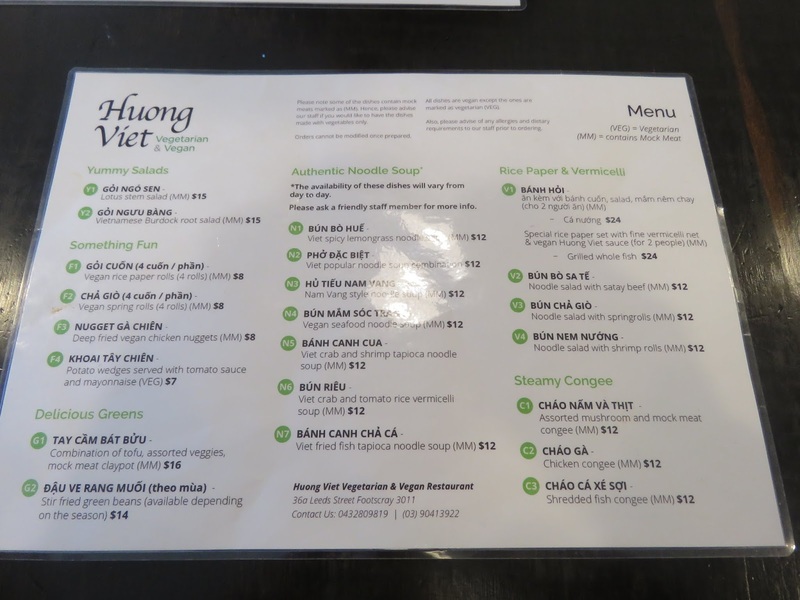 The vegan Vietnamese menu is still a good one; we grazed on steamed dumplings and fried wontons ($6.80 per plate) and tentatively folded our own lemongrass mock-beef and tofu rice paper rolls ($16). 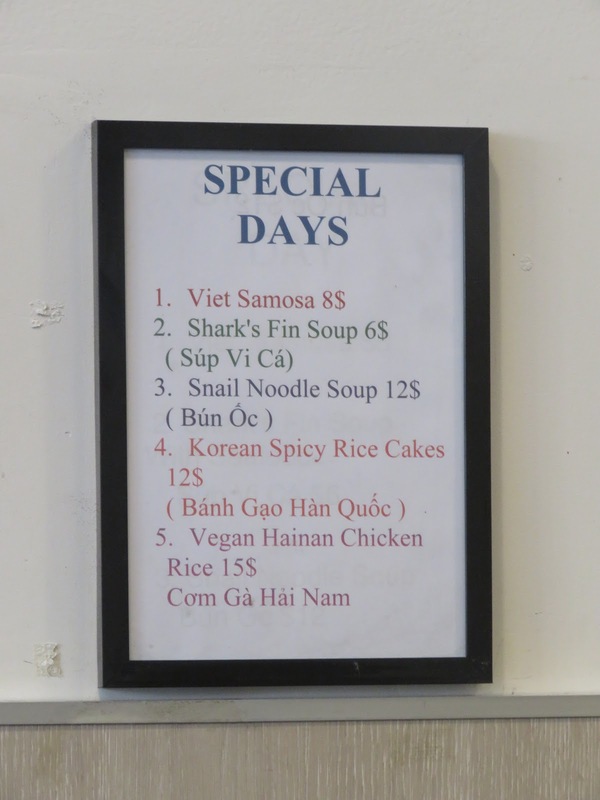 The highlight was probably the bubbling vegan fish stew in ginger mushroom sauce ($16.80). Next time: the Chef's Special vegan duck. Our Saturday night visit to Bodhi with a fellow Melbournite was much more carefully planned. The restaurant's evening menu is a la carte, but includes many of the small shared dishes offered during their more famous vegan yum cha. We dived into the mocktail list ($14.50 each, the sweet-and-sour toilet-cleaner-blue Just My Imagination is pictured above) and ordered so much deliciousness to share! The BBQ buns ($9.50) were lighter than usual, and I loved the gua bao bun 'slider' ($17) stuffed with salt and pepper 'chicken', Malay peanut sauce, cucumber and herbs. The laksa ($25) was difficult to divide, but perfect comfort food on a blustery night. Though we would have gladly eaten at Bodhi three more times, we checked in to a few new eateries too; they're up next.